Atlantic Marine of Wilmington, N.C., earned the Gold Anchor Sales Award as Grady-White Boats’ top sales award worldwide. Grady-White Boats president Kris Carroll (front row, left) and sales vice president Joey Weller (front row, right) present awards to dealers. Atlantic Marine of Wilmington, N.C., earned the Gold Anchor Sales Award, Grady-White Boats’ top sales award worldwide. 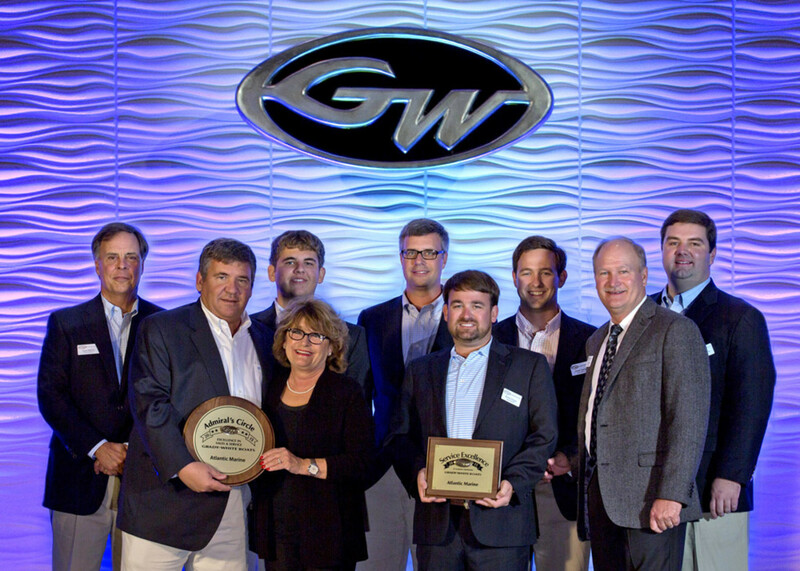 The dealership also will be recognized with membership in Grady-White’s Admiral’s Circle for model year 2016 — the sixth consecutive year Atlantic Marine has earned that achievement. The Gold Anchor award signifies that the dealer’s overall rank is the highest in sales dollars among Grady-White dealerships. “In addition, they have helped to carry on the Grady-White spirit of delivering the ultimate boating experience by marketing in a top-class manner, utilizing a superior knowledge of the products and taking great care of their customers,” Weller said.